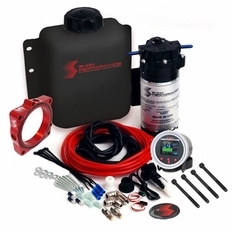 The all new Snow Performance Stage 2 Boost Cooler is the only water-methanol injection system tailored to your 2008-2017 Dodge Charger, Challenger 5.7 V8. Unlock 50-70+HP on your vehicle while decreasing your air temps by up to 100 degrees! Increase your pump gas octane by 25 points and make more power efficiently with a cooler running motor! The Stage 2 uses a progressive controller that proportionally injects more or less according to boost pressure. Start and full points are adjustable for engagement and delivery curve to match what the engine requires. Proportionally injecting according to boost pressure gives an accurate delivery of water-methanol and allows cooling and performance improvements over a wide range for improved drivability. New for 2016, the Stage 2 introduces the VC-50 Controller. The VC-50 offers the functionality of a boost gauge and water-methanol controller all in one! Highlighting a 7 color (Blue, White, Red, Yellow, Orange, Purple, Green) OLED screen displaying boost, percentage of injection, low level, secondary nozzle activation, prime button, and 2 fault codes directly on the screen. Equipped with a Camaro 6.2L throttle body spacer plate you can now mount up to two water-meth nozzles in a clean custom package. The part number for this item is 2170 and it fits 2008-2017 Dodge Charger, Challenger 5.7 V8 vehicles that have either a Turbocharger or Supercharger. This kit will not work on a vehicle without a turbocharger or supercharger, as it is boost controlled. 1. Low cost - where else can you get up to 70-100HP for as low as $519? 2. Greatly reduced EGTs - Decreases of 250 degrees F are common using a 50/50 water/methanol mix. Increased EGTs are an engine killer in today's performance diesel world. 3. Efficiency - Fuel economy increase - increase your fuel economy up to 10%-15% (1-3 mpg). 4. Greatly increased air charge densities - 3-5 psi boost increases are common with liquid intercooling. 5.Allows you the ability to greatly increase boost on turbos and superchargers (if you have one). 6. Ideal for heavy loads and towing! 2. If I don't have a turbo or supercharger, can the Boost Cooler be applied to naturally aspirated and or nitrous engines? In this application, water/methanol injection allows the use of pump fuel in all but the most extreme situations which effects tremendous cost savings as well as horsepower increases due to air density increase and realized timing potential. The system is activated by a boost referenced switch so that injection takes place only during high engine loads when needed. Unlike gasoline engines, the power in a turbo diesel is largely a function of fuel. The problem with continually adding fuel is that you create an overfueling condition and reach a point where the exhaust gas temperatures become prohibitive (over 1500 degrees F). A Snow Performance Methanol Injection kit, using a 50/50 water/methanol mix will decrease EGT's approximately 200-300 degrees F while increasing power 70-100HP safe and effectively. A. Air charge cooling - Water/methanol will lower air charge temps over 200 degrees F in this application. Low air temps makes denser air charge which provides more molecules of oxygen for combustion. B. Combustion conditioning - the methanol acts as a combustion catalyst as well as a cooling agent. Water increase torque and power output through "the steam engine" effect. Where else can you get this kind of power with cooler EGT's, reduced emissions, and more fuel economy? In most instances our standard 2 quart reservoir works well to provide the required amount of fluid. We have seen that a 2 quart reservoir provides enough fluid for a 400-500 hp car to make 12-15 full throttle quarter mile passes. For those looking to get more range out of their system, they can tap into their factory windshield washer reservoir and use it to hold water/methanol. This is a good option because most washer reservoirs have a large capacity (normally at least a gallon) plus they're already methanol resistant (washer fluid has methanol in it). Also, the washer reservoir is already under the hood so it doesn't require having to add another bulky item into the engine bay.